Phiaton has released two fresh new design to its line of premium audio offerings with the BT 460 wireless over-ear headphones and MS 300 BA in-ear headphones. Designed with a stylish, minimalistic exterior and innovative features that improve the listening experience, the new product introductions cater to young audio enthusiasts who appreciate style and performance. Touch Interface: Allows you to control your music, calls and volume with a swipe of your finger on the outer ear cup. Smart Play Pause Function: Automatically detects whether a headphone is being worn or not and will play and pause automatically. Phiaton ShareMe™ Connection: Allows two people to listen to the same music or watch the same movie at the same time. Vibration Notification: Signals when a call is being received or you have stepped outside the communication range. aptX Technology: Increases digital streaming efficiency and improves overall dynamic range. Bass Optimizer: Phiaton’s new technology “Acoustic Pressure Balancer” helps to reduce the reverberation and deliver well-balanced and accurate sound with powerful bass. Clear Voice Capture: The BT 460 cVc ® technology makes phone calls crystal clear for the person on the other end of the line. Phiaton's new MS 300 BA are dual driver in-ear headphones which combine the detailed bright treble qualities of a balanced armature driver with the rich and warm sounding qualities of a dynamic driver. In addition, the MS 300 BA have a low-frequency pass filters to reduce high frequencies and help improve the bass response of the dynamic drivers. 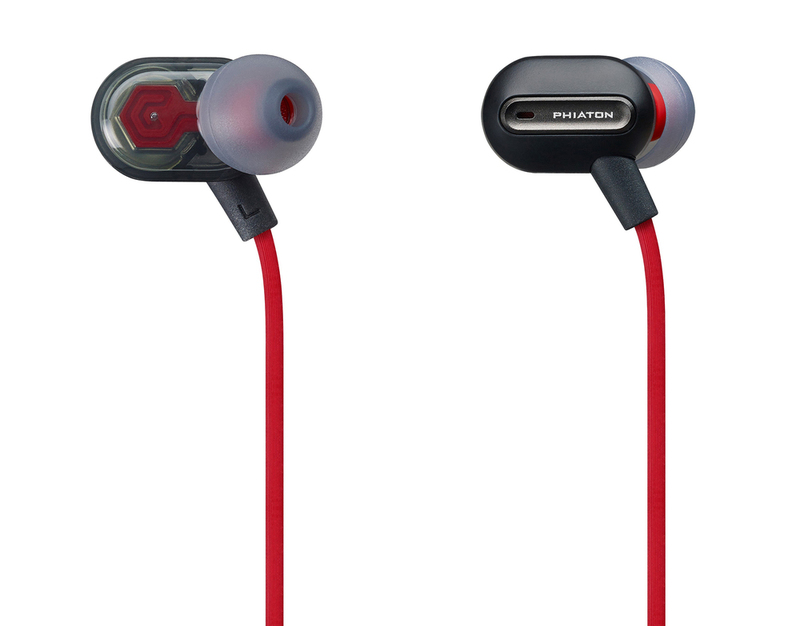 The MS 300 BA have a semi-transparent design that gives you a peak inside the inner workings of the in-ears while a tangle-free cable features an in-line remote and microphone. Experience high frequency tones like never before in an earphone. The balanced armature driver technology makes each vibrant note come alive, letting you hear all the textured nuances and precise details of your favorite classical, guitar, and string music. Low Frequency Pass Filter: This specialized filtering process optimizes acoustics by filtering out high frequency sound waves from the Dynamic Driver, allowing the driver to hone in on low frequency precision and improved bass. This enables the Hybrid Dual Driver to enhance sound quality along the entire frequency spectrum. The BT 460 wireless headphones are now available in white or black for $249 and the MS 300 BA in-ear headphones are available in white or red for $99.